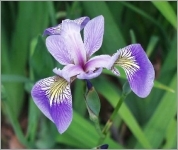 Iris versicolor, the Blue Flag Iris, is a hardy lakeshore perennial herb of shallow water. It is a native of Eastern Canada and the Northern United States. This well-known plant is from 2 to 3 feet height. Good for water gardens and bogs. One of the easiest, and showiest, of aquatics for the home gardener. The flowers are consisting of 3 sepals and 3 petals. 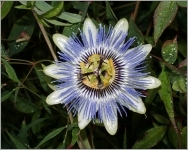 The flowers are large, 3-4 inches across, showy, light to deep blue with yellow and whitish markings at the base of the sepals. They appear atop erect stems, bearing from 2 to 6 flowers, from May to July. The erect stem, sometimes branched near the top. It produces narrow, slightly arching, sword-shaped, blue-green leaves, no more than 1 cm wide. The plant spreads by means of its modified stems, rhizomes, which are located below the soil surface.